The fragility of the human condition, impermanence, disintegration, and other such themes dwell at the heart of most works of art in more or less explicit ways. Taking these as curatorial cue, Amanda Sroka – the Philadelphia Museum of Art’s Assistant Curator of Contemporary Art – presents Into Dust, a quiet but punchy group show featuring works from Lorna Simpson, Joseph Beuys, Louise Bourgeois, Gabriel Orozco, On Kawara, Felix Gonzalez Torres, Anselm Kiefer, Ann Hamilton, Paul Thek, Alfredo Jaar, Alan Sonfist, and James Turrell (among others). This stellar lineup lends to a complex constellation of objects, images, and sounds that probe deeply into what it means to be human, to be artist, and to be political, along with the contingent realities of time, body and matter that punctuate those efforts. 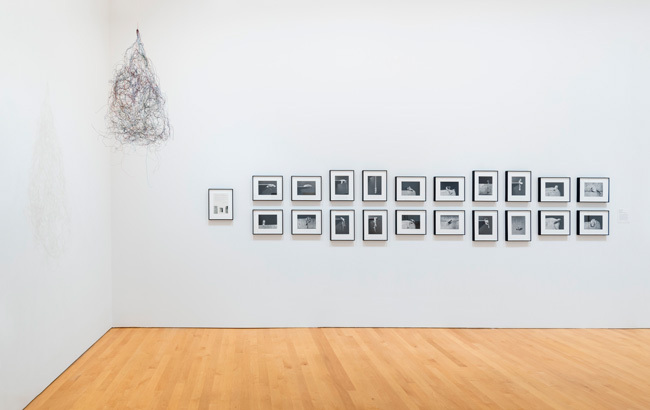 To witness these works together – their existential capacities highlighted by the show’s theme and by effective artist statements and quotations featured alongside the objects – is to view them not only as art, but as artifact; objects bound by their time and place that speak beyond their makers, in conversation, of a human concern with deeply human matters. Missing from the show, if anything, is a wider breadth of investigation in terms of culture, medium, and angle. 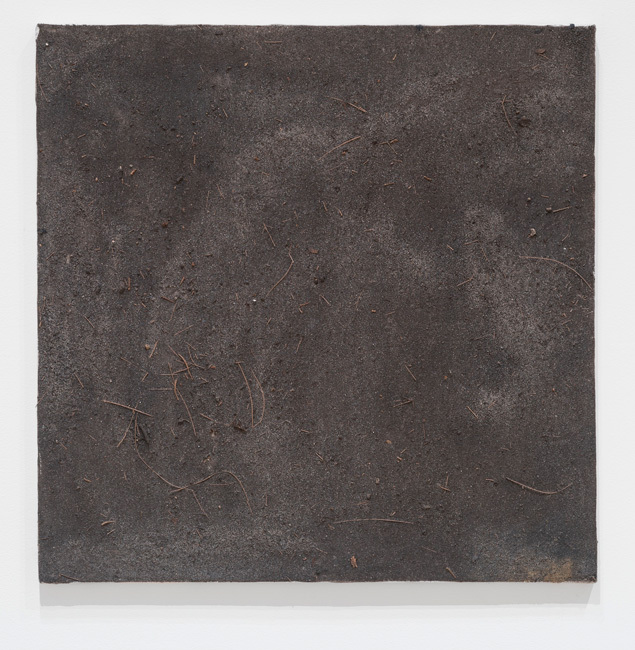 Still, Into Dust capitalizes on the capacity of the thematic group show to feature distinctive visual arguments and offerings toward a common concern; in this case, a deep attunement to and questioning of the human condition as it stands (and has always stood). 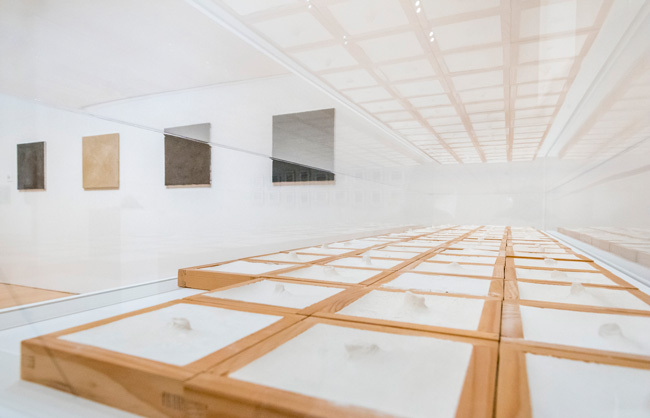 Works by On Kawara, Gonzalez Torres, James Turrell, and other famous art-philosophers are stunning and expected pieces in a show of this nature. 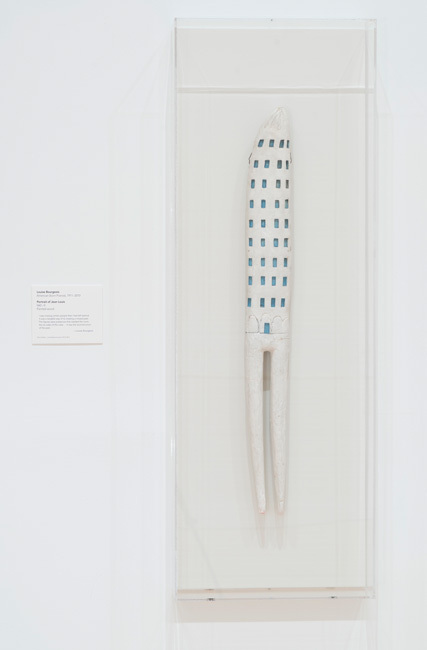 Lesser known pieces by well known artists induce more delight and frenzy, such as Louise Bourgeous’ 1947 Portrait of Jean Louis, a curious tooth-like painted wood totem/architecture mounted as specimen. Accompanying her piece is this statement: “I was missing certain people that I had left behind. It was a tangible way of creating a missed past. The figures were presences that needed room, the six sides of the cube… It was the reconstruction of the past.” This quirky, elegiac work pays homage to the idiosyncrasy of acts of remembrance. 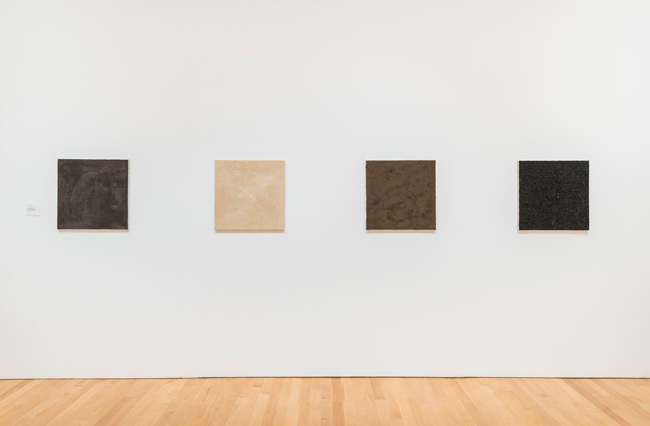 Alan Sonfist’s Earth Paintings (Florida, Indiana, New York, Hawaii, 1968-9) are more indexical records of earth time and locality, each canvas literally boasting the colors and textures of their sites of collection, “dust” of the earth made permanent. Several works by lesser-known artists, such as Marie-Ange Guilleminot and Alina Szapocznikow are straightforward and enchanting, and enrich the more familiar lineup. Guilleminot’s series Navels – quite literally, plaster impressions of different peoples’ navels mounted on wood – call on Duchamp’s bodily plaster casts, highlighting not female organs but a physical feature common, and instrumental to, all humans. Inverting these omphalos and presenting them in a cluster, the work is a simple study of generation, connection to generations past, and to each other (turning the self-interested omphaloskepsis – navel-gazing – into a more communal reflexivity). Szapocznikow’s gelatin silver prints and statement are strange, simple and eerie. “All I am able to produce are ungainly objects”, she writes, beside her grayscale chewing gum compositions, acknowledging the maladroit nature of certain aspects of making and existing. Yet her words and graceful photographs offer the possibility of a sort of inspired transcendence through visual language and form. 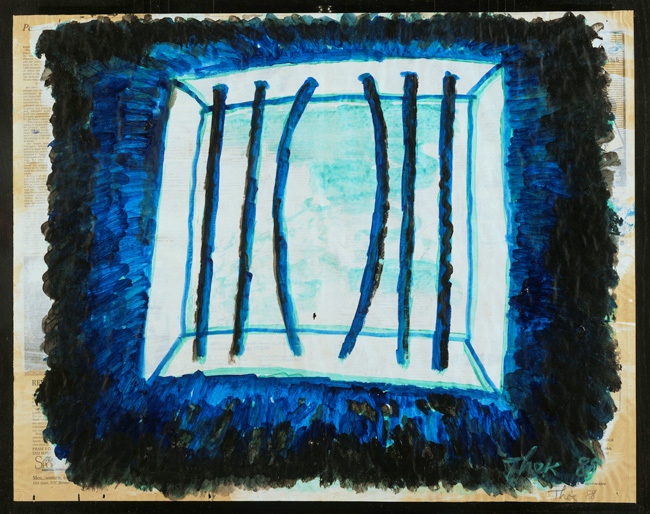 A Paul Thek painting on gessoed newspaper, Way Out, shows a set of archetypal prison bars, the middle ones stretched open in attempt to escape. In relation to the scale of the painting, the bars could hardly accommodate a hand, let alone an entire person. This piece emphasizes the theme that underpins the entire exhibition, a tragicomic sentiment expressing the simultaneous futility, yet addictive (and perhaps unavoidable) allure, of being and making. The show thus becomes a meditation more than a statement, providing exquisite form for questions that we all carry. “I sometimes think that there is nothing but time, that what you see and what you feel is what time looks like at the moment,” writes the late Paul Thek, encouraging the reader/viewer to appreciate the grandeur of the moment, now passed. Kaitlin Pomerantz is an artist in Philadelphia.